Éamon Ó Cuív says it was “entirely false”. ÉAMON Ó CÚIV has described the portrayal of his grandfather Éamonn De Valera in RTÉ’s Rebellion as an “embarrassment”. The Fianna Fáil TD has said that it was an ‘embarrassment that public money was spent on Rebellion’, adding that he thinks it was wrong to broadcast it ahead of the general election. Speaking to Irish-language news website Tuairisc.ie, Ó Cuív said that what they showed of his grandfather was ‘entirely made up’. There is no basis at all for the representation of Éamonn de Valera or of the common perception of him at the time on the programme Rebellion. It was entirely made up and it’s an embarrassment to RTÉ to spend public money – and they spent a lot of it – on this type of programme and not give a truthful portrayal of real, historical people – including Markievicz, Pearse and de Valera. De Valera featured in the final two episodes of the series and was generally shown in an unfavourable light. In the final episode, the former Taoiseach and President was shown throwing up as he faced a British firing squad. In reality, he never actually faced execution. The show also debates whether or not DeValera’s command of his troops in 1916 saw him refuse to come to the assistance of other rebels who were in trouble. Reacting to the programme, Ó Cuív says the fact that it was a drama doesn’t excuse it from having its facts right. “It’s not right to represent historical figures in an entirely false way, even in creative work,” he argues, adding that the pre-election timing was also wrong. In Dev’s case, of course, he was the founder of Fianna Fáil and it is a twofold embarrassment that they would broadcast such a programme when an election is looming, because in the public mind it could give a bad image of Fianna Fáil, especially because Éamonn de Valera is so connected with the party, even to this day. Email “Dev's grandson says RTÉ's portrayal of him in Rebellion was 'an embarrassment'”. 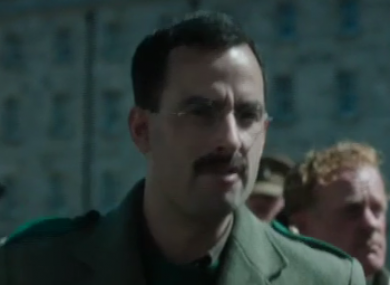 Feedback on “Dev's grandson says RTÉ's portrayal of him in Rebellion was 'an embarrassment'”.